William Judge mentions in this chapter the “S.P.R.” - the London “Society for Psychical Research”. In the 1880s, the leaders of the S.P.R. made a false investigation against Helena Blavatsky and called her a fraud. One century later, other members of the same S.P.R finally re-examined the “case” against H.P.B. and admitted in 1986 that it was her “trial” that was a fraud, and that she was innocent. That did not prevent a couple of pseudo-theosophical editors from spreading since 2001 the same old slanders against H.P.B. 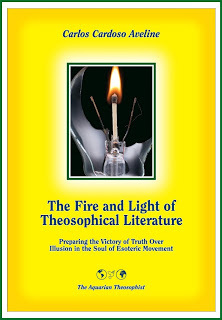 by boldly including them in compilations of books presented as “theosophical” and published by the “Theosophical Publishing House” in the United States. This time the slanderers did not take the trouble to present any false proofs. They aim at sowing doubts on H.P.B.’s character. They defend themselves saying that “there are also authentic documents” in their compilations. Such a re-emergence of old slanders is an additional evidence of the law of cycles: even lies tend to re-emerge from time to time - to test one’s vigilance. The renewed (and half-disguised) attacks against H.P.B. also show that Theosophy is very much alive, and that it represents a mortal threat to a number of powerful vested interests which entirely depend on the continuance of the present level of ethical blindness and spiritual ignorance on the part of our mankind. Attention and discernment are therefore necessary at all times and all circumstances to theosophists - and to every person of good-will. By the middle of the penultimate paragraph, in the printed magazine “The Path”, H.P.B. seems to mention “Uncle Roster”. As we work on the present edition, we have the copies of “The Path” which belonged to Boris de Zirkoff and which he donated to the United Lodge of Theosophists in Los Angeles in July 1978. These copies have a few handwritten annotations by Zirkoff, in pencil. Where the printed magazine says “Uncle Roster”, Zirkoff made a correction and wrote: “Rostya”. In fact, H.P.B. had an uncle called Rostislav, as transliterated in the Chapter 7 of the letters as edited by W.Q. Judge, or Rostislov, as transliterated by Sylvia Cranston. We are therefore eliminating the word “Roster”, and adopting “Rostya”. In one of the letters in this chapter, H.P.B. quotes Paul’s statement in the New Testament according to which he was “caught up to the third heaven”. The passage is at 2 Corinthians 2:12-14. Chapter II opens with a reference to the phenomena mentioned in Chapter I. “HPB - The Extraordinary Life and Influence of Helena Blavatsky, Founder of the Modern Theosophical Movement”, by Sylvia Cranston, G.P. Putnam’s Sons, New York, 1994, 648 pp., see the opening of chapter 11, Part 01, p. 33.